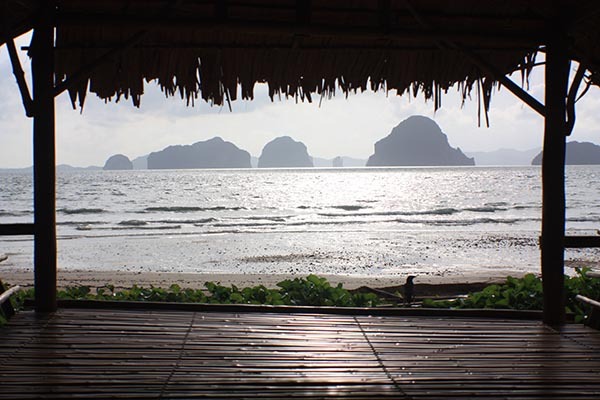 Today I’m in Krabi. It’s on the opposite side of the Isthmus from Sichon. 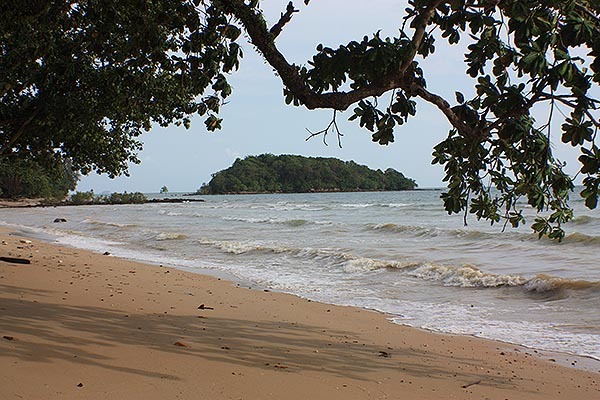 I believe Isthmus the correct word for the narrow strip of land that separates the Andaman Sea from the Bay of Bangkok. 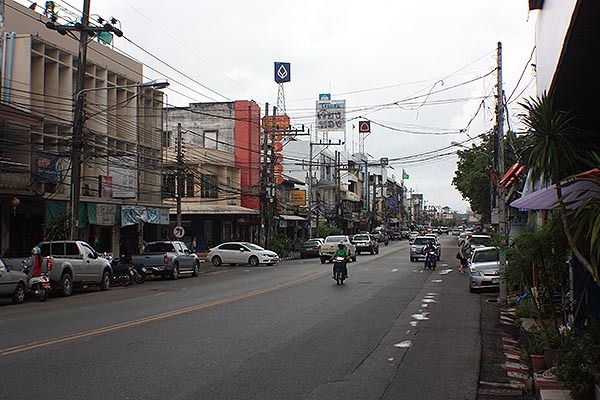 For much of its length, although narrow, it shares a border with Burma, but where I am, it’s Thailand on both sides. The reason I’m here doesn’t really matter. There’s something I need to do tomorrow, and I decided a one-day round-trip wasn’t going to be a barrel of laughs, so I’m having a mini-vacation. Well, maybe one night away from home would be more of a micro-vacation, but you get the picture. 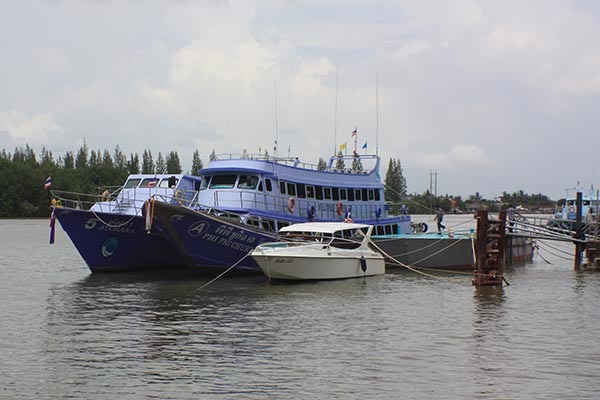 The journey from Sichon was easy but boring. Mostly four lane straight highways with maybe four or five bends. If there were more – I was asleep! 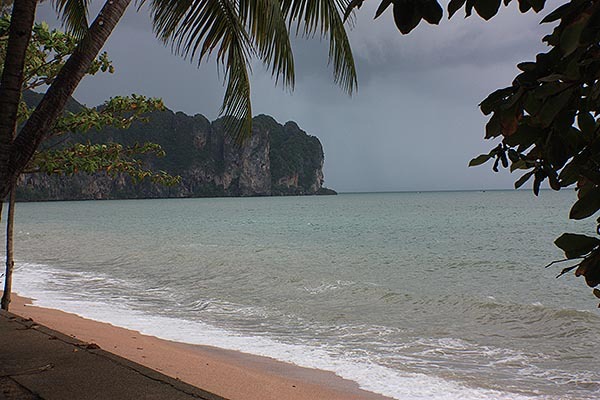 The scenery became more interesting closer to Krabi, but at the same time the skies darkened and torrential rain began. 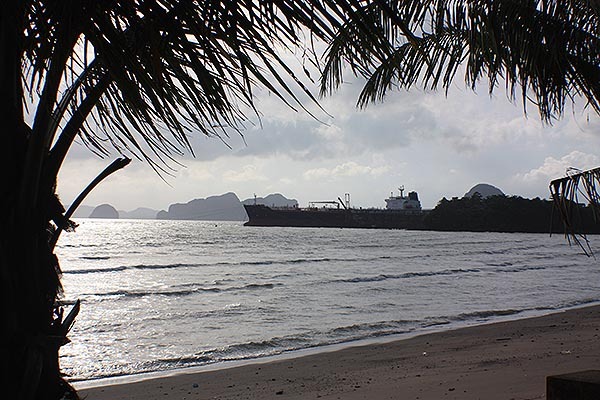 It reminded me of another mini-vacation to Krabi some years ago – which involved four days of rain, an hour of sunshine for photo taking, and a bottle of duty-free rum. Oh well, there are worse ways to spend four days I guess. Anyways, my drive took me a smidgen over two hours, which is not bad for 220kms. The word “smidgen” I believe is unique to the British Midlands, my birthplace, and means “a very very small amount.” For example, if I was to ask my mother “Would you like more cake?” she’d think for a moment and say “Well, I really shouldn’t, but maybe just a smidgen.” She’d get a large slice, complain bitterly, and then proceed to eat the whole lot. The next slice might be a real smidgen! 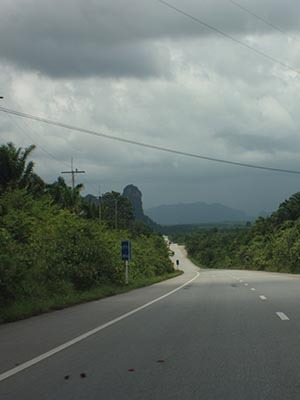 The area in and around Krabi is quite strange in that it’s basically flat land, with large blobs of limestone hills randomly dotted around. They are called karsts, and I guess if I put on my best imitation of an upper-class British accent, I could call them plaster karsts. But that would be silly, so I won’t. 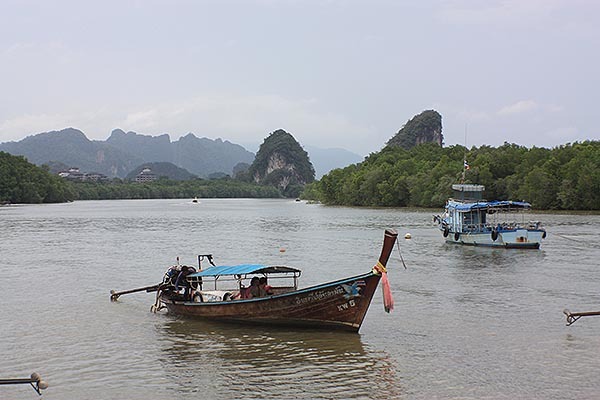 When people mention Krabi it’s hard to know if they mean the town or the Province. 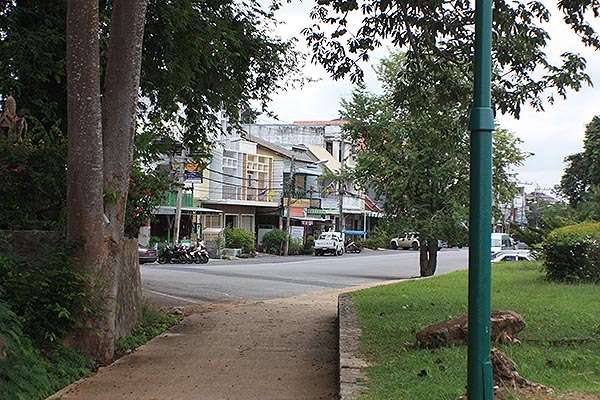 The town is really quite small, and it’s the place I decided to base myself for easy access to the airport – which is where I need to be very early tomorrow. 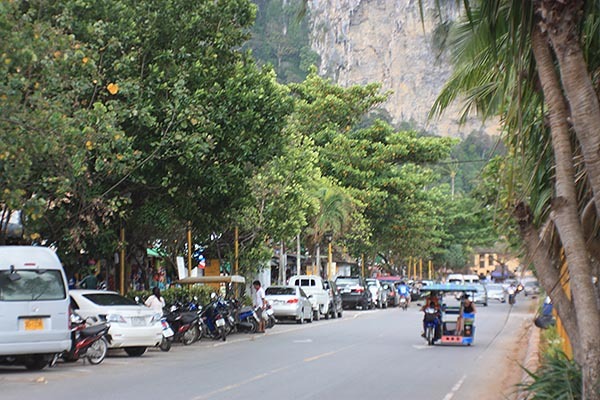 Actually, Krabi town is a good location for easy access to anywhere. 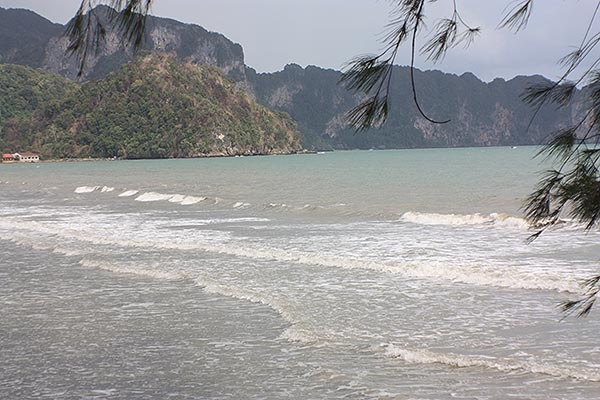 But most people head to the beaches, which are anywhere from ten to 20 kilometers form Krabi town. 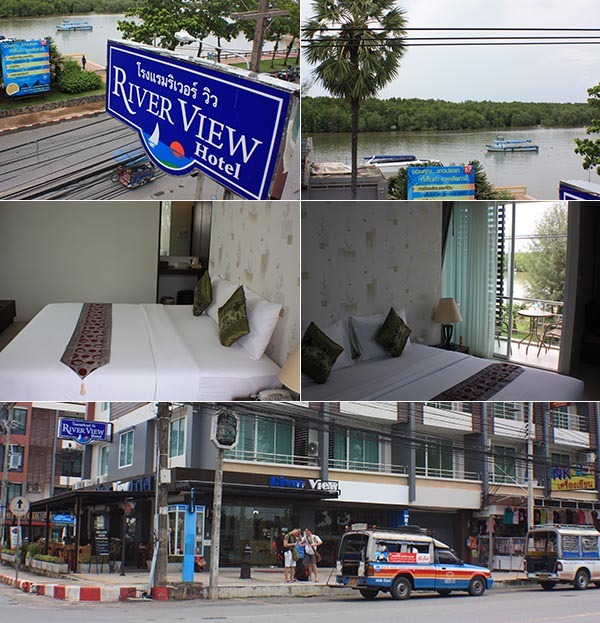 Thanks to Agoda I found something called the Riverside Hotel, which really is. 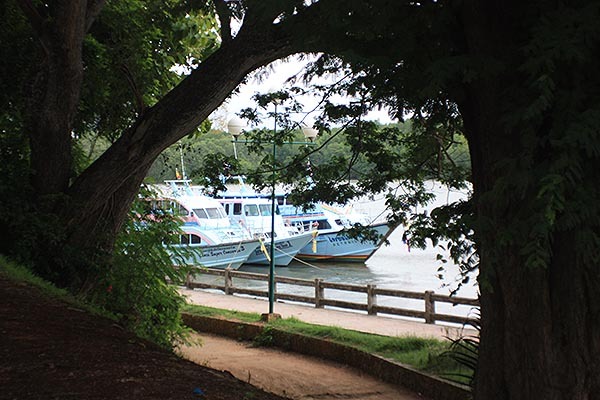 Actually it’s a perfect location for river or sea trips as there are jetties all along the river. The opposite bank seems to be largely uninhabited, which makes the cross-river views nicer. The hotel was great. Spacious, clean modern rooms – with fast WiFi – all for about THB 1100 a night (about US$35). I probably should say “The hotel is great” since I’m writing this at a restaurant just down the road, while waiting for veal sausages and salad, and downing a large bottle of my favorite Chang beer. I know; veal sausages are not very Thai, but the fact is, as much as I like Thai food and Asian food in general, unless I go where there’s a concentration of farangs (and there certainly are plenty in Krabi) I never see European food. So, it seemed like a good opportunity to taste something different. In a few paragraphs from now I’ll be able to tell you if I made a wise choice. Or, if the service is slow, I’ll have downed so many Changs I will neither know nor care! Yes, the sausages were great! Anyways, having checked in to the hotel around lunchtime I headed out almost straight away to explore the town. It wasn’t actually raining at the time, but the clouds were dark and threatening, and I could see there were rain squalls close by, so I didn’t venture too far. As you can see below, there’s not much to the town, but the riverside views are nice, even without sunshine. Later in the day I stuck my nose into this rather strange combination of coffee place and used book store. There didn’t seem to be anyone around either to make coffee or to sell books, so I browsed, and after a while I found a large pictorial book of Burma that took my fancy. Eventually I found a young girl hiding at the back of the store and asked her “How much?” but her surprising reply was “That book no sell.” Hmm, interesting. 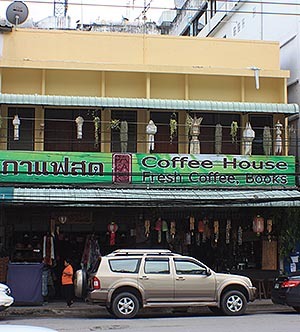 A combination coffee shop and bookstore that doesn’t make coffee and doesn’t sell books. Interesting concept. Welcome to Thailand. BTW, WTF is this place? Actually, a bar! And so now, a day later, I am back home. I chose to use some country roads rather than the expressway. It took about 30 minutes longer, but I got to see some of the real Thailand, and I enjoyed the drive. Actually I enjoyed the whole trip. 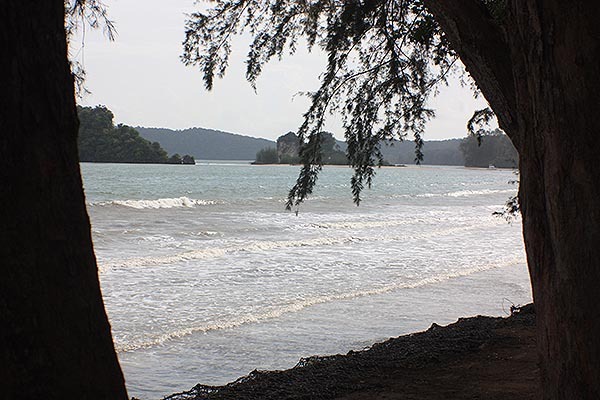 Krabi is nice. I shall return. Just in closing, I needed to find the International Terminal at the airport. 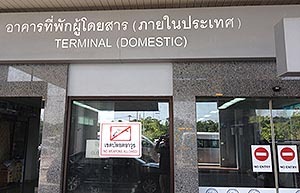 There’s no signs in any language to tell you which terminal is which, or which airlines operate from which, so I started at Terminal 1, which clearly says “Domestic”. Then I went to Terminal 2, which was totally deserted. Followed by a trip back to Terminal 1 to ask where the International terminal might be hiding. Well, guess what? Terminal 1 is the International terminal, and when I pointed out that the sign said otherwise, I was met by looks which meant “yeah, so?” followed by the helpful comment that “Airport Management hasn’t upgraded the signs.” Oh, and by the way, to enter, you walk towards the doors that clearly say “No Entry” and they magically open. 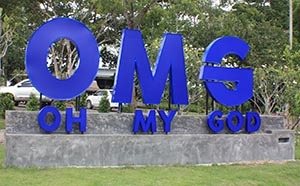 Ya gotta love Thailand and its quirks. I guess I’m now one of them.